On Facebook we learned that the word is spreading like wildfire. 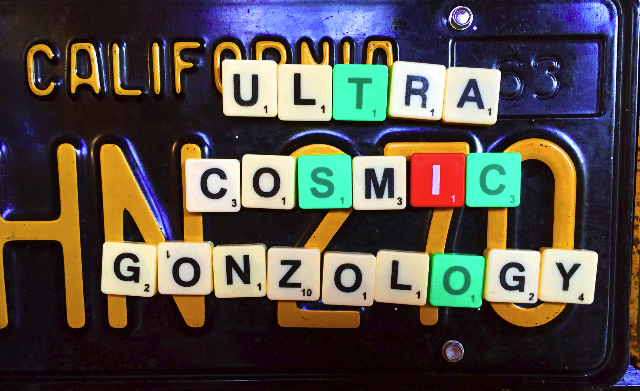 While dining at a taco joint in Vermont, laid back and cool, Brian and Leanne Jewett encountered a California license plate with letters spelling out the title of my third book Ultra Cosmic Gonzology. The book is in the final stage of proofing and will be available sooner than the blink of an eye. The work is inspired on a daily basis by Astrid Hiemer as first reader, mentor and muse. The first book of poetry, Shards of a Life, was launched at The Mount, in Lenox in June 2014. That was followed by a preview of Total Gonzo Poems at the Williams Faculty Club in November, 2015. The latest volume of hipster verse will be launched with a reading at the Gloucester Writers Center, on Wednesday, August 31 at 7:30 PM. The address is 126 East Main Street, Gloucester. Jay Jaroslav will serve as MC. The reading includes Gloucester based poems and ones about the historic Nugents of Rockport. They will be presented under the long shadow of the formidable poet Charles Olson. During the week long residency I plan to read Olson, view his archives, and talk with those who knew and admired him. There is the challenge of walking in the footsteps of giants. The three books have common threads. There is a mix of family history, jazz, blues and rock profiles as well as philosophical speculations. The second book vividly presented evidence of my assertion as the first to utter the now ubiquitous word gonzo. It combines compelling and irrefutable documentary evidence as well as examples of the genre in poetic form. This unique literary development has been aptly chronicled and analyzed in essays by Robert Henriquez. He has followed and discussed this literary project from its inception. Given the broad interest in gonzo as a word, paradigm of hipness, and literary style there has been a progression from mean streets to the groves of academia. Hence, a newly coined term gonzology which conveys all things related to gonzo as an ecstatic state of far out being. As the title of this thick and profusely illustrated new book suggests the treatment is ultra, in the sense that it extreme by every measure. It is also cosmic in its outrageous, extra terrestrial scope and far reaching ambition. It is the ne plus ultra of all things gonzo. That is however the very essence of gonzo which delights in hyperbole. "Sounds like my kind of literature! Hope Amazon sends me the book ASAP!" "Sorry to miss the gig I'll be in Brazil." "Have you generated a new redundancy, like “Pizza Pie ?”"